One of the biggest challenges for moms with new babies is finding the time to exercise. Having a baby is a full-time job, and it may be overwhelming trying to fit in exercise to get back in shape after pregnancy and birth. Many moms also put off exercising as they feel that it will cost a lot of money on either expensive gym memberships or exercise equipment. You don’t need a gym or much time to get the benefits of exercise, and you can even do it in your own home, with your baby. This is becoming more and more common, as it is convenient and allows you to spend some extra quality time with your little one. Here are some exercises that you can do with your baby and you don't need any exercise equipment. Before you get into your exercise routine, it’s important to warm up so you don’t hurt yourself. To do these stretches, sit on the floor with your legs straight out in front of you, and lay your baby on her back on your legs, with her head resting on your shins. Reach down towards your baby’s head and your toes as far as you can and feel your hamstrings and back muscles stretching. Another stretching exercise that you can do is to lie on your stomach, and then lift your torso up to stretch your abdominal muscles, while keeping your hips on the ground. Your baby can lay on his back on the floor in front of you, and as you come back down, you can give him kisses or talk to him to keep him entertained. In this exercise, you can either hold your baby or have her in a stroller. As you hold her securely or push the stroller, step forward and bend your knees at a 90-degree angle. The weight of your baby in the front may hurt your back, so to avoid this, make sure that your abdominal muscles are tight when you do this exercise. Also take care not to lose your balance which could happen if your knee extends over your toes. Repeat this several times on each leg. This exercise will target your legs, abdominal muscles and your back. Lie on your back on the floor, bend your knees and have your feet flat on the ground. Your baby can sit on your pubic bone, either sitting up or reclined back onto your thighs. Hold your baby securely by placing your hands around his body. Next you can lift your head as well as your neck and shoulder muscles up off the floor, and while doing so contract your abdominal muscles. Count to two as you lift your head up, and as you lower your head, count to three. Try doing this exercise between 15 to 20 times. You can make this fun for you and your baby by talking or playing with him as you come up to his eye level. From this same position, you can also do sit-ups. To do sit-ups, lie on your back and bend your knees 90 degrees with your feet firmly on the floor. Your baby can still lay on your stomach or pubic bone again while you hold his hands, and then move into a sitting position. When you come up give your baby a kiss. Carefully lower yourself back to the floor, and then repeat 15 to 20 times. First you can do baby overhead presses. To do this, you can sit with your legs crossed on the floor. Hold your baby around her torso in front of you so that you are face to face, and then straighten your arms up until your elbows lock, which will lift her up over your head. Do 10 repetitions of this exercise and then rest for a few minutes and then do two more sets. The second set of presses is the baby bench press, which you can do laying on your back, and have your knees bent and feet planted on the floor. Again, hold your baby around her torso, and then contract your abdominal muscles, while at the same time squeezing your shoulder blades together. As you do this, bring your baby in close to your face and chest. 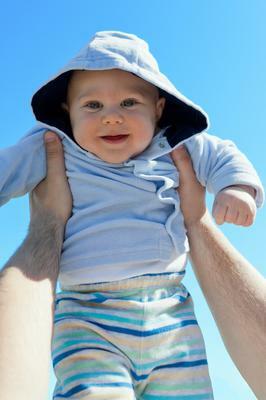 As you lift your baby in the air again, relax your abdominal muscles and then repeat 10 times. Take a rest and then do two sets of this exercise. You can also start this exercise with your back on the floor, but bring your knees up in the air and bend them 90 degrees, and lay your baby on his tummy on your shins. Next contract your abs and bring your hips up off the floor as you hold his hands to steady him on your legs. While you do this, lift your head and shoulders. Lower yourself back to the floor and repeat 15 to 20 times. As you lower yourself back to the floor in this exercise, it will rock your baby back and forth, and you can also play or kiss his face as you lift yourself up. Stand with your feet about 30 centimeters away from the wall, and hold your baby to your chest, but facing out so that the back of his head is resting against you. Next you can bend your knees as if you would if you were sitting, but using the wall against your back for support. Your knees should not extend further than your toes. Hold this position for ten seconds before standing up and repeating ten times. This exercise will give your legs and buttocks a workout. Stand with your feet shoulder-width apart, and hold your baby against your torso, but have him facing out. With your feet facing outward, bend at the knees and squat as low as possible, and then return the standing position by pushing yourself back up from your legs, not your back. Repeat this exercise 10 times. You can do this exercise in front of a full length mirror so that you can interact with your baby and see each other. Squats are great for working out your legs, and strengthening your back and abdominal muscles. Have your baby lying on his back on the floor beneath you as you are on your hands and knees. Lower your forearms onto the floor and your shoulders should then be in line with your elbows. Next, slide your knees back about 30 centimeters, and make sure that you keep your abdominal muscles contracted. Talk or sing to your baby while you hold this pose. When starting out, hold it for around 30 seconds, and as you become stronger, you can hold it up to two minutes. This exercise will help tone your stomach, arms, back and buttocks. With your baby still lying under you on the floor, and you on your hands and knees again, make sure that your head, neck and back are in a straight line. Next arch your back up, and while doing so contract your abdominal muscles. Lower your chin so you are facing your baby, and hold for five seconds. Then lift your head up again, and reverse the arch and hold again for five seconds. Repeat this exercise ten times. This exercise targets your abdominal muscles, chest, back and shoulders. Your baby can continue lying on the floor, but this time you can stand with your feet either side of him. With your hands on your hips, bend forward slowly at your hips, and keep your back flat. Hold that position for five seconds, and then bend further down and tickle or play with your baby for ten seconds. After this, slowly stand back up while bending your knees, and do five repetitions. This exercise focuses on your hamstrings, hips and back. This is another exercise that you can do while your baby is lying on the floor underneath you while you are on your hands and knees. Lift one of your arms out in front of you so it is parallel to the floor, and then do the same with your leg on the opposite side. Hold this pose for five seconds, and then change to the other arm and leg and hold for five seconds. You can repeat this exercise five times on each side, and it will benefit your back, abdominal muscles, buttocks, shoulders and your hamstrings. Keep in mind that just as stretching and warming up at the beginning of a workout is important, it is also important to cool down and to stretch after your workout too. Remember to get the "all clear" from yours and your baby’s doctors before starting any exercises as starting too soon can be risky for both you and your baby. Well how about you share it so someone else can get some good advice?